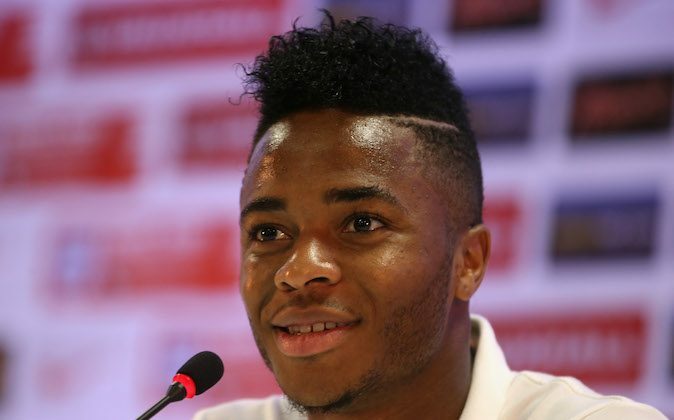 England forward Raheem Sterling only has one kid, and he loves his mom Nadine. The 19-year-old youngster, who put in an impressive display during England’s match against Italy recently, has been rumored to have four kids, but according to Sterling, it’s all false. Sterling only has one daughter, Melody Rose, who he describes as “the best thing that’s ever happened” to him in a BBC interview. Rose was born in 2012 after a short relationship. Another important person in Sterling’s life is his mom, Nadine Sterling. “She’s a big part of my life – she tries to have too much of a say sometimes! I try to listen to her, because most of what she says is right,” Sterling added. Despite the occasional clashes — Raheem jokes that Nadine Sterling “thinks she’s Jose Mourinho” — he clearly appreciates her care and concern, as he has the words “Thank you mama for the nine months you carried me, through all the pain and suffering” tattooed to the inside of his left bicep. Check out an AP article on Sterling. RIO DE JANEIRO (AP) â Four years ago, Raheem Sterling was watching the World Cup eating pizza with his friends. Now, the 19-year-old Liverpool winger is the pick of the skilful newcomers giving England hope after its opening loss to Italy. Sterling has transferred his talents seamlessly from the Premier League to the international arena. Deployed as the playmaker by Roy Hodgson, Sterling took on established opponents without fear, withstanding the heat and humidity in Manaus to zip across the pitch dribbling through the Italian defense. But personal plaudits seemed inconsequential to the Londoner, who didn’t want to dwell on the 2-1 defeat in which his vision was exemplified by opening up the Italian defense in the leadup to Daniel Sturridge’s goal. Losing admirably won’t do again on Thursday against Uruguay, which opened Group D with a more demoralizing collapse to Costa Rica. The Jamaica-born Sterling, who grew up in London near Wembley Stadium, is cautious about expressing a preference to starting in the middle or in his more familiar club position on the wing, instead highlighting his versatility. He received advice before the game from Wayne Rooney, who burst onto the international scene a decade ago as England’s teenage star at the 2004 European Championship. “Express yourself and enjoy the game and not think too much about what’s going on,” Sterling recalled Rooney telling him. While Rooney comes under public scrutiny over his failure to score across three World Cups, the 28-year-old striker is still someone the young players in the England squad study for tips. The striker Sterling will come up against in Thursday’s game is more familiar to him than Rooney: Liverpool teammate Luis Suarez. “I’d rather not see him on the pitch, really,” Sterling said. “He is a great player, but I don’t think we really need to talk too much of his qualities because we all know what he can do.